Typical projects in Rudiments II include animorphic heads, spoons, center-punches, chisels, and brackets. As always there will be time after the hammers are down for questions and further discussion. Taking the classes Rudiments I, Rudiments II, and Rudiments III is the equivalent of taking The Basics of Blacksmithing class. 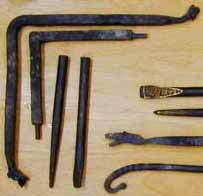 Students should have taken Rudiments of Blacksmithing I. Gift Certificates for Rudiments of Blacksmithing II are available. So far, 4 students have applied to be in this Rudiments of Blacksmithing II.